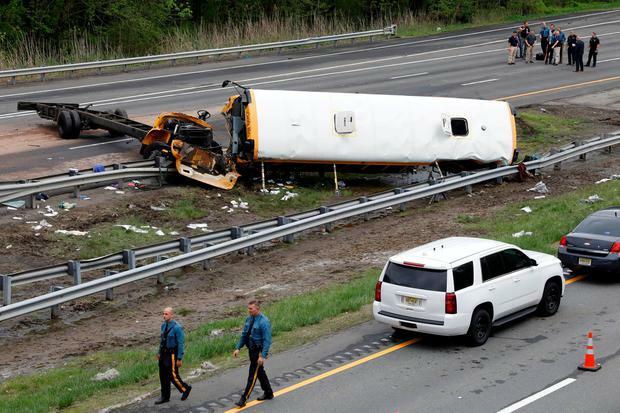 A teacher and student have been killed after a US school bus taking children on a field trip to a New Jersey historic site collided with a dump truck. The front end of the school bus appeared to be ripped off in the accident on Interstate 80 in Mount Olive. Some of the victims crawled out of the emergency exit in the back of the bus and an escape hatch on the roof. More than 40 people were taken to hospital. A red dump truck with a mangled front end was parked along the highway nearby, about 50 miles west of New York. The truck was registered to Mendez Trucking, of Belleville, and had "In God We Trust" emblazoned on the back of it. "It's a horrific scene," Mount Olive Mayor Rob Greenbaum said. "Our hearts are broken by today's tragedy," Democratic New Jersey Governor Phil Murphy said. 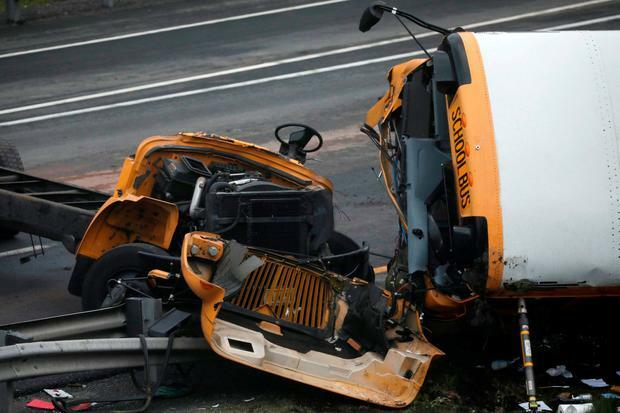 Paramus Public Schools said that the bus was taking students from East Brook Middle School to Waterloo Village, which is about five miles from the crash scene. Zainab Qureshi, 11, said she was on one of the two buses not involved in the crash. She said those two buses made it to Waterloo Village, but they were told by teachers that they had to return to school because of bad weather. She said students did not find out about the accident until they arrived back at school. Mendez Trucking has about 40 drivers and trucks, according to the Federal Motor Carrier Safety Administration. Its trucks have been in seven crashes in the last two years, none of them fatal, according to the FMCSA. Mendez was fined in 2016 for violating regulations on inspections, repairs and maintenance and post-crash drug and alcohol testing, according to the FMCSA. "From what I saw, the red truck was destroyed, but the bus appeared worse," Manuel Absalon, a tourist from Mexico driving by the crash site, told WNBC-TV. "It looked like it was broken in half." Waterloo Village is a historic site depicting a Lenape Indian community and once-thriving port along the Morris Canal in north-western New Jersey. It features several historic homes, a blacksmith shop, general store and more.